I'm working on some craft tutorials at the moment but I can't show you any of them yet, so instead here are some fun summer-y projects from my blog archive (all with a butterfly theme) and some suggestions for possible variations. 2. Use paper butterflies to add some extra prettiness to plants you're giving as a gift. Iinstead of using my butterfly template, you could use pictures of real butterflies or buy a butterfly stamp from a craft store, stamp it onto your chosen paper and then cut round it. butterflies to add to tags. For a sparkly look, try decorating one of the butterfly shapes with glitter! 4. Make a butterfly curtain. The butterflies and doilies would also make a lovely summery-y garland if strung horizontally. If you cut your butterflies from white card, you and/or your kids could have lots of fun painting the butterflies in bright colours before using them to make the curtain - and double-sized butterflies would be even more fun to paint. 5. 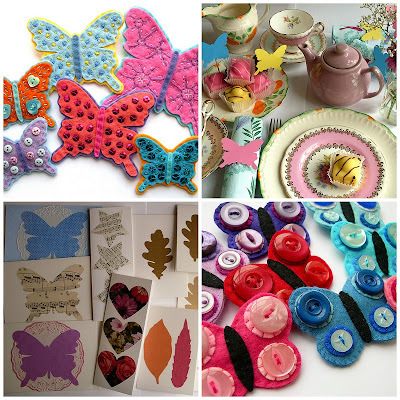 Make felt butterfly brooches decorated with embroidery, sequins or mini buttons. These would also make sweet headbands or ornaments. If you're giving one of the brooches as a gift, pin it to a square of plain felt and use washi tape to attach the square to a blank card... then write a message like "Happy Birthday!" underneath the butterfly. 6. Have a butterfly-themed tea party, with butterfly cake/sandwich toppers and butterfly napkin rings. I used plain card for my butterflies, but you could use pretty patterned paper, or stamped or printed pictures of butterflies. 7. Use doilies and pretty patterned paper to make butterfly cards. These are a great way to use up pieces of pretty gift wrap that are too small to use for actual gift-wrapping. Colourful pages from magazines (like pictures of flowers) would also look great. Or you could shrink the butterfly template to make small butterfly shapes, and stick several butterflies on one card instead of the one large shape pictured. 8. Or make simple felt butterfly brooches decorated with buttons - this tutorial also includes a variation that uses felt circles instead of buttons. 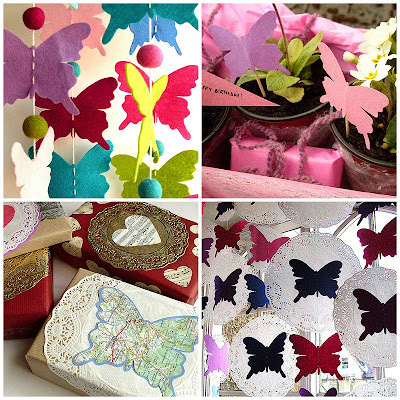 You could also use this simpler butterfly shape when making some of the other butterfly projects in this list, as it's a lot quicker and easier to cut out! You can find lots more free crafty tutorials HERE. So many beautiful ideas, thank you !